Telus World of Science is still encased in scaffolding with the Telus sign peaking out of the metal cladding. 12 cranes dot the horizon downtown while a cold wind scours the concrete apron encircling Science World. After inhaling my $8 mostly edible White Spot burger I headed back inside to do battle once more. 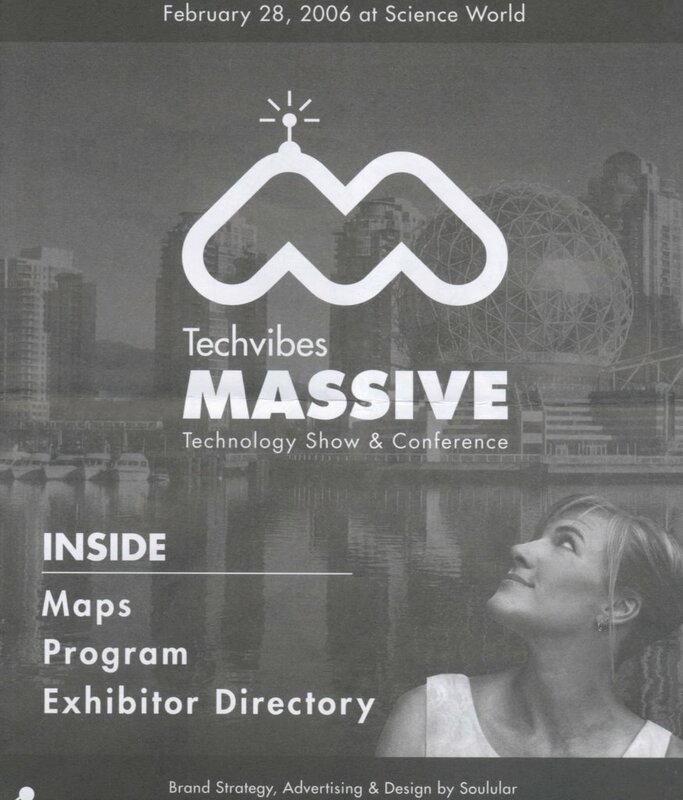 Techvibes’ Massive Conference/Showcase was well laid out in a circular fashion on 3 floors with a central showcase open auditorium area for quickie 15-minute pitches for various products. I was somewhat impressed by CelVu’s product (Press release here) which enables clients to download pics to their cell phones of their residences and potential burglars as well as traffic hotspots. The software came with a disclaimer “Do not use while driving” which drew visions of hundreds of drivers (if the company can sell to enough people) pulling off the road and downloading the latest pic of Granville and 70Th and immediately hanging a U-turn and all racing off to find a quicker way to their destination. Chris Scholefield of CelVu did the sales pitch and with 15 years or so of Motorola experience behind him, I can’t help but think that it’s a solid product. Curtis Nicholson explained the benefits of VoIP to businesses. The notion of Telus trying to save customers money strikes me as little odd but I guess as long as the stock price keeps on going up, the shareholders will remain happy and Darren Entwhistle keeps his job. Seems to me that VoIP is mainly useful to businesses that have a T1 connection which enables upload and download speeds to remain equal, i.e. no jitter/dropped packets etc, which you’d get with a cable/ADSL connection. Security also seems to be an issue unless info is routed along secure VPN lines; Gahtan’s Blog has something to say about this. However there are certainly cost savings to be had by eliminating long distance charges. Vicky Ryan of Chalk Media enlightened us about E-Learning and added more acronyms to the heavy load we already bear. When the whole English language becomes a long list of acronyms what then? She briefly demoed a rather spiffy looking in-house training module that Future Shop uses to train their salespeople. Remember that, next time a horde of salespeople descends on you touting the latest MP3 Flash player. Perhaps head over to Best Buy where they don’t work on commission but may well have had a similar e-learning experience. Unfortunately I missed Dave Chalk’s Web 2.0 talk opting instead for the Telus VoIP session. Moving on to the booths here are some quick thoughts. I had some enjoyable chats with many people and lets face it they were busy trying to promote and sell product/services although one particular individual might at least have nodded in my direction. Marqui.com were the one and only (that I came across anyhow) company promoting business blogging software (apart perhaps from Bryght. Great T-shirt Mr. Kris Krug!). Great idea however they seem at the moment to be mainly concentrating on Marketing/Communication professionals. I was intrigued by how the “Approval Loops” are integrated into the modules and how well this would work in companies. Still love the sleek looks of the Fujitsu Laptop’s. Someone hired some top-flight designers for this company. iStock Photo. Apart from being exceedingly friendly and willing to chat this Calgary based company supplies Photographs to anyone willing to purchase them. Sort of a cheaper Getty/Corbus web service. Although I see now that they have been purchased by Getty but are supposedly to remain independent of the parent company I was impressed although came away not quite clear on how copyright issues were dealt with. More research on their web site I guess is needed. Grabbed a few copies of Backbone magazine (Business/Technology and Lifestyle) apparently included in the Globe and Mail. It’s a well-written mag, which also includes a column by none other than Jim Harris, leader of the Green Party! Not necessarily likely to get me subscribing to the Globe however. 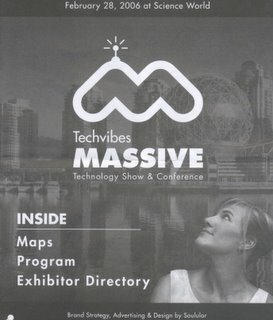 Keith Stacey, Sales Director of IVCi(Video Conferencing) seemed quite content to let me chat to Monica in Calgary? over a somewhat overloaded T1 connection. Blame all those Exhibitors and attendees. No hard selling here he was easygoing and relaxed. What a pleasure. Mission Control is another company (“No matter how well organized we are we simply can’t get it all done”) that’s attempting to change the stressful Workday habits we all seem to have. Here’s another quote from their blurb. (“Your work habits are causing your stress-not your work”) Speaking for myself I’d have to say that’s often the case. Francesco de Gaetano, Sales Associate for Mission Control took the time to explain the company’s mission (sorry!) and considering he has a Masters Degree in Psychology seems to have the requisite qualifications. Mission Control has done some work for Microsoft and you can view a demo here. So hopefully business was done/networking opportunities kindled. Competitors rejuvenated. Thanks to Rachel for the ticket and the warm welcome! Thanks very much for visiting Marqui's booth at the show. If you are interested in getting a better look at how the approval processes work, just let me know -- I would be happy to give you a demo.